Luckily, The Unfortunates had been done previously at the Oregon Shakespeare Festival in Ashland. Even though the show has changed a lot since then, I rented the wigs that they used, to have a starting point. 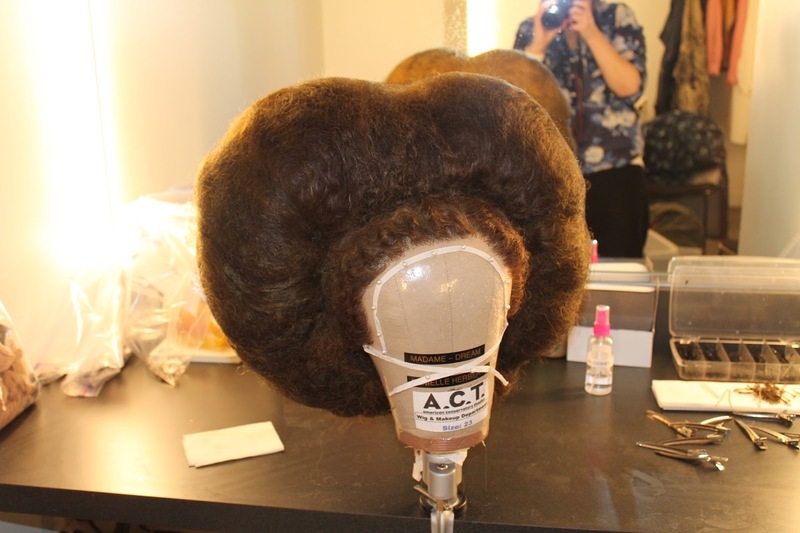 Only half of one of those wigs made it into A.C.T.’s production, and that’s our big lady [Madame’s wig]. I rented that one because building it from scratch would have been a large process. It’s built with a wire understructure, kind of like scaffolding. Then there’s netting with hair sewn over it, so it’s light enough that the actress [Danielle Herbert] can dance and move. Madame's wig in The Unfortunates. Photo by Shannon Stockwell. Rae [played by Taylor Iman Jones] is using her own hair. We had to find a style that would hold up, because she doesn’t have arms to move it off her face—the character is armless in the dream world, and Jones performs with her arms bound in a costume piece. We actually talked a lot about what to do if something goes awry with her hair. We made sure that the the other actors knew that if she was nuzzling up against them at a part she didn’t otherwise, it might be because there’s hair in her nose, and she can’t fix it because she has no arms. She’s trapped. That was something that we had to be very conscious of. There are a lot of quick costume changes in this show. How are those done? Danielle and Amy [Lizardo, who plays Handsome Carl] have a two-minute quick change, full costume and wig. We only have two people running costumes for the show. So that’s a lot to do. We had to figure out how to quick-rig Handsome Carl’s first wig so she could take it off herself. So her first wig is just some hair sewn on to a wig cap with a handkerchief over it. Amy comes offstage, pulls that off on her own, starts to run her quick change, and by the time our wig person is available to put her next wig on, she’s ready to go. When does that quick change happen? It’s during the scene where Joe and his friends are prisoners of war, near the beginning of the show. They’re going from their recruitment scene costume to the dream world look. They finish one song, there’s a blackout with an explosion sound, and before they even go offstage, the cast has to change the costumes of the three guys [Joe, CJ, and Coughlin] while they’re onstage in the dark. Then they book it offstage to stage right while stripping. It’s crazy. I love things like that. To learn more about the production design of The Unfortunates, click here to purchase a printed or digital copy of Words on Plays, A.C.T. 's in-depth performance guide series. All proceeds go to our ACTsmart education programs, serving teachers and students throughout the Bay Area.